As a small business owner the vision for your business is crystal clear in your mind; you can see yourself basking in glory as the money rolls in. But what about your small business core values? If you don’t set these early you risk losing sight of what it is that makes your business unique. Without values you may struggle to know if you are on the right path and it will be harder to decide on goals, or even to make any decisions at all. In short, it is essential to set the core values of your small business or risk putting its future success in jeopardy. Sound scary? Don’t worry, setting values for your business doesn’t need to be a headache. What are small business core values? First thing’s first, do you even know what core values are? Put simply, your small business values, sometimes also called corporate values, are the fundamental beliefs of your small business. They will be your guiding principles that will help you to choose what action to take or decision to make in any given situation. Core values are not strategies or best business practices and they aren’t intended to describe the sort of work you do. Instead, the core values of your small business should underpin all the work you do and how you interact with others. They should make it clear who you are and what you stand for and will guide you when it comes to making decisions. As you grow, perhaps even beginning to hire staff, your values will help you and your employees know right from wrong and whether you are fulfilling the goals of the business. They can even help you to choose who to employ, who will be a good fit for your business, based on whether they can identify with the values you have set. Your values set a clear guide for anyone involved in your business, including you, to live and work by. Plus, they let your prospective customers and clients know what to expect from you. We listen, we care, we serve. We practice open, real communication. We face challenges with optimism. We innovate and constantly improve. We believe in people and their dreams. Grow our business in a way that makes us proud. Recognize that passion and personality matter. Communicate fearlessly to build trust. Defend and respect the user’s voice. Reach every person on the planet. When you are clear on your core values and live them every day, rather than file them away somewhere, they can have a very real and positive impact on your small business. It’s pretty clear then that failing to give your values adequate consideration could have disastrous consequences for your business, as you may end up feeling your way in the dark. But too many small business owners continue to miss this vital step. In the rush of excitement of setting up a new business, and with the ease at which it is possible to get started with online ventures, such as Amazon selling or making and selling crafts, tasks such as setting values can easily be overlooked. In fact, it can seem entirely unnecessary for an individual who is running a small business perhaps as a side hustle or hobby. But if you have any ambitions for your business to grow, it is essential to think about your core values. 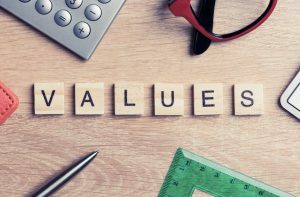 Don’t simply pluck values out of thin air, however, in order to get this job ticked off your to do list. If you force values into your business, it will soon become clear they don’t align with what you actually do and believe, which will only cause confusion further down the line. There is no set number of values you need to have but somewhere between 5 and 10 is a good number. Too many and you (and your staff, if you have them) will feel overwhelmed, too few and you may find you haven’t truly captured everything that is important to your business. It’s important to discover your core values, rather than pick them from a list. You can search online for lists of values and you will find hundreds of suggestions. But picking values that sound good is not the best way to find the right ones for you. You need to uncover the values that are instinctively yours. “What do I love about working in my business?” Is it the freedom to be creative? The attention to detail? Or the quality of what you produce? “What is unique about my business?” Customer service? You get results? “If I started a new business tomorrow, what core values would I build into it?” Passion? Simplicity? Accountability? 2. Spend 10-15 minutes answering these questions. Write down everything that comes into your head on a separate post-it note. At this stage you don’t want to limit the number of ideas you come up with. 3. When you’re done you will need to organise your ideas into groups. You will notice that several ideas are similar and can be grouped together, for example you may have written ‘creative’ and also ‘imaginative’, but these could be combined under one theme. 4. Once you have 5-7 groups, choose an overarching theme for each one. This could be one of the values from the group that you feel encomapasses all the others, or you may need to come up with a short sentence that comprises several ideas. These are your core values. 5. Now that you have your final list, does it resonate with you? If you look at your list and it doesn’t describe your business as you think it should, go back to the drawing board. You need to be able to uphold your values in years to come, you will need to internalise them and draw on them to help you make business decisions. If they don’t sound right, now is the time to fix that. Have you already set the values for your small business? How did you choose them? Let us know in the comments and help others learn from your experiences too! Having obtained a degree in Psychology, coupled with extensive study in the Personal Growth field, Robert also has a successful 15 year career in Management. Presiding over multi-million pound businesses, Robert has advised, developed, coached and mentored hundreds of people from complete newbies to CEOs. ← Are You Making These 5 Mistakes on Social Media?